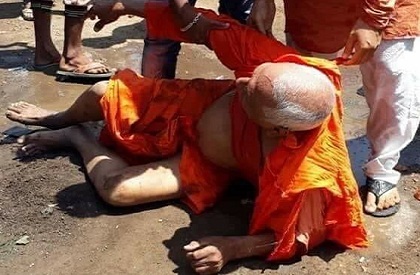 RANCHI: Social activist Swami Agnivesh was attacked and brutally thrashed by a group of Bharatiya Janata Yuva Moracha (BJYM) members. Agnivesh, who is an Arya Samajist, was beaten up and his clothes were torn. The BJYM members slapped and hit him until he fell down. BJYM is a youth wing of the BJP. The veteran activist got injured in the attack. According to local police, Agnivesh had arrived in Ranchi. He was staying in a hotel and was scheduled to leave for Pakur. When he came out of the hotel, the BJYM goons targeted him. All of them pounced upon him and began beating him up. Agnivesh's companions and hotel staff was left shell-shocked at the sudden attack. Later, the police force was called. Swami Agnivesh later said that he had no inkling as to why he was targeted. After the incident, there was wide spread condemnation. Chief minister ordered an investigation. Subsequently, over a dozen BJYM men were arrested. Police said taht 20 persons who were involved in the assault were caught. Sources said that the BJYM members felt that Agnivesh was a supporter of Christian missionaries and acted against the interests of the Hindus, hence, they targeted him.